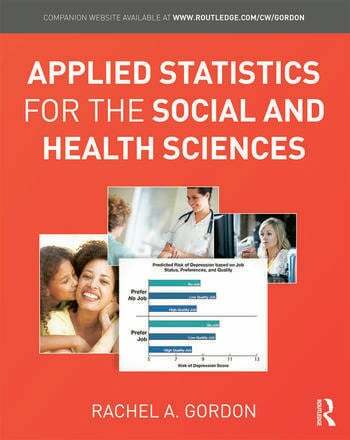 Applied Statistics for the Social and Health Sciences provides graduate students in the social and health sciences with the basic skills that they need to estimate, interpret, present, and publish statistical models using contemporary standards. The book targets the social and health science branches such as human development, public health, sociology, psychology, education, and social work in which students bring a wide range of mathematical skills and have a wide range of methodological affinities. For these students, a successful course in statistics will not only offer statistical content but will also help them develop an appreciation for how statistical techniques might answer some of the research questions of interest to them. This book is for use in a two-semester graduate course sequence covering basic univariate and bivariate statistics and regression models for nominal and ordinal outcomes, in addition to covering ordinary least squares regression. teaching of both SAS and Stata "side-by-side" and use of chapter exercises in which students practice programming and interpretation on the same data set and course exercises in which students can choose their own research questions and data set. Rachel A. Gordon is an Associate Professor in the Department of Sociology and the Institute of Government and Public Affairs at the University of Illinois at Chicago. Professor Gordon has multidisciplinary substantive and statistical training and a passion for understanding and teaching applied statistics. "True to its title, it is ideal for a wide range of social and health sciences. The examples are practical applications where students will be interested in the results. Including both SAS and Stata code and exceptionally clear help interpreting the results sets this book apart from the rest." "I have been teaching a year-long graduate level statistics course to first year sociology, education, policy analysis and demography Ph.D. students for the past 39 years. I have always pieced together material from several different textbooks, software manuals, and published articles, since no one volume met the need to provide entering graduate students with appropriate content coverage at the right difficulty level. Rachel Gordon’s new book meets these needs better than any other volume I have seen." "This book is a teacher’s dream, perfect for an applied regression course in the health sciences. After covering introductory statistics and classical regression, it offers a sophisticated yet accessible approach to the generalized linear model, particularly with regard to logistic regression. Numerous excerpts from recent research papers complement the text nicely. I know of no book like it."